Art – MY CHICAGO HOUSE. I posted the “before” photos of the dining room many months ago, when it was gray (and boring! ), and I am not quite ready to post the “after”, but I’ve certainly made progress. What makes this room special is that all of the major elements were either made by hand or procured second hand from Ebay and 1stDibs. The most expensive item in this room was the paint. We painted the dining room Ellis Green from Farrow & Ball for a big impact. While the dining room has a lacquered look and feel, it is actually a high gloss finish and not a traditional lacquered application which is why it is not a perfect mirror, but it is close. This saved ~$5k and it works. I love the high gloss green and it makes a big impact for less [than Swedish putty / lacquer]. The inspiration home (linked above) was painted with the traditional lacquer treatment. Otherwise the paint color and finish (high gloss) are exactly the same. Comparing the two rooms you can see a difference, but one that I am willing to live with for the savings. The ceiling and molding is painted Wimborne White. Similar to the guest room, the rug was from Ebay and is an Asmara needlepoint rug. It was a great price (<$1,000) and a perfect fit, in perfect condition. The chairs were an Ikea hack with a $25 Ikea frame and leather strips purchased from an online supplier, based in TX. I posted a tutorial on these chairs on my old blog that you can find here. The chairs were ~$90 each. My father made the table and the bar cabinet. The artwork is my own and flanks the large window while it awaits the perfect chintz drapes, TBD. I have pulled a few samples and am working on my final selection for long drapes, but haven’t made a final decision yet. The fireplace is marble and was custom made for the house (by the prior owner). We will hang a large piece of art over the fireplace this month. The piece that I have chosen is currently in a show at Downs & Ross in New York. I will post the great unveil when it is hung! We are slowly building our art collection and this was our first real piece. We bought this Charles Mayton painting from the David Lewis Gallery in New York. 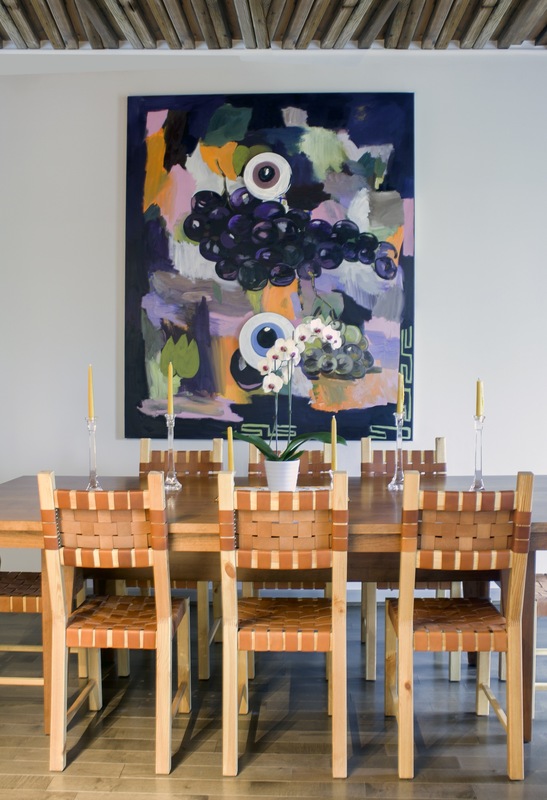 We love this piece and it looks beautiful over our dining room table (that my dad made) and chairs (that we made). See this post for how-to make the chairs from $25 Ikea frames (steal!). The painting was described to me as a re-imagined still life. The artist pushed the boundaries with his use of the canvas, hanging the “plates” separately. It is fresh and modern and I love it.